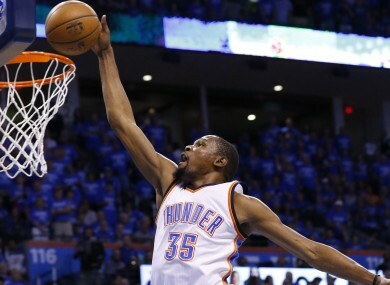 The Thunder, led by a 37-point tally from Kevin Durant, got the better of San Antonio – to the surprise of many. THE OKLAHOMA CITY Thunder completed a stunning series win over the San Antonio Spurs to reach the NBA Western Conference finals courtesy of a 113-99 victory in game six. Not many people had given the Thunder a chance against the Spurs, who finished 12 games clear of Oklahoma City in second position during the regular season in the west. But led by Russell Westbrook and Kevin Durant, the Thunder – who missed the play-offs last season – defied the odds to earn a 4-2 series victory and a showdown with reigning champions the Golden State Warriors for a place in the NBA Finals. The Thunder – back in the conference final for the first time since losing to the Spurs in 2013-14 – were in control throughout, limiting San Antonio to just 31 points at half-time. San Antonio responded with consecutive 34-point quarters following the main interval but Oklahoma City were not to be denied. Westbrook posted another double-double, finishing with 28 points and 12 assists, while Durant top-scored with 37 points. Steven Adams also had back-to-back double-doubles via 15 points and 11 rebounds. Kawhi Leonard’s 22 points led the Spurs. Veteran Tim Duncan had 19 points in what could have been his last NBA game. Email “Oklahoma shock the hotly-tipped Spurs and advance to Western Conference final”. Feedback on “Oklahoma shock the hotly-tipped Spurs and advance to Western Conference final”.